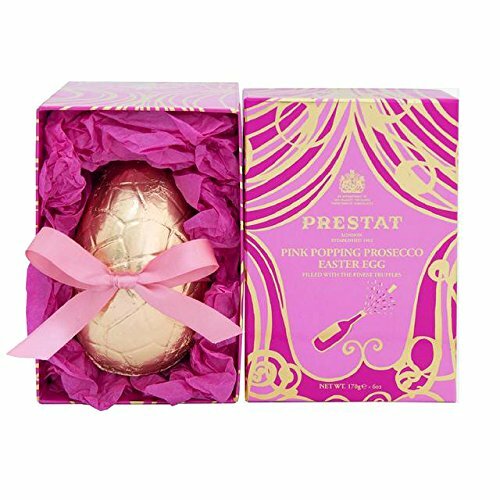 If you are on the hunt for delicious Easter gifts or treats to indulge in then we’ve got some seriously tempting inspiration for you this afternoon. 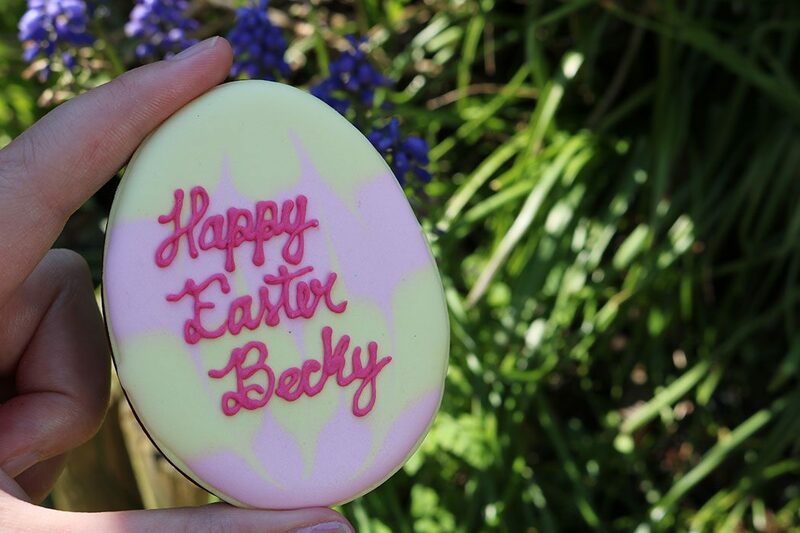 From Easter eggs to yummy biscuits and chocolates, we’ve got you totally covered. The Solid Chocolate Company eggs – Made up of 42 separate pieces of delicious Belgian chocolate, The Solid Chocolate Company eggs are available in five delectable flavours: Caramel Milk, Dark, White, Milk and Columbian Dark. After completely selling out last year, the eggs are sure to be a smash for 2018. The Solid Chocolate Company Original Chocolate Eggs are available for £24.99 each at www.solidchocolateco.com. Passion Fruit Caramel (a fruit flavoured caramel truffle enveloped with a white custard ganache in a milk chocolate shell) Salted Peanut Caramel (a sumptuous salted caramel yolk surrounded in a crunchy peanut praline and milk chocolate shell) and Crispy Toffee Caramel (crunchy rice popper praline concealing an explosion of gooey salted caramel). 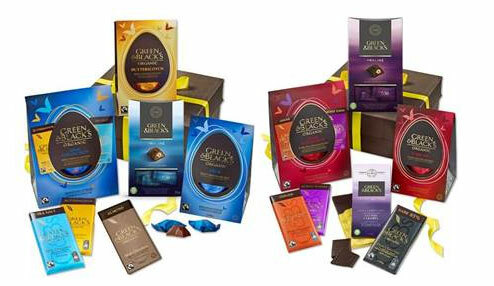 Green & Blacks Easter Eggs – Green & Blacks always impress with their delicious Easter offerings. For 2018 you can choose from various Organic Large Milk Eggs 365g (RRP: £10.99) Green & Black’s organic Milk Luxury thick shelled Easter Egg. Accompanying the milk chocolate Luxury Easter Egg are two of their most luxurious bars, Milk with Butterscotch and Milk with Sea Salt. Organic Large Dark Egg 365g (RRP: £10.99) Green & Black’s organic Dark Chocolate Luxury thick shelled Easter Egg. Accompanying the dark chocolate Luxury Easter Egg are two of their most luxurious bars, Dark Chocolate with Ginger and Dark Chocolate with Burnt Toffee. You can also pick up some amazing Green & Blacks gift boxes packed with yummy treats! Green & Black’s Milk Easter Collection: (RRP: £34) – Green & Black’s Milk Easter Egg collection makes the perfect chocolate gift for indulging all your family and friends at Easter. Delivered in G&B’s gift box with a yellow hand tied ribbon. Open the G&B’s Easter Milk collection basket to reveal a selection of milk chocolate Easter eggs and milk chocolate bars. The Easter collection also includes new G&B’s Milk Chocolate Pralines elegantly packed in a gift box, these tempting treats have been expertly crafted to make the perfect present for chocolate connoisseurs. 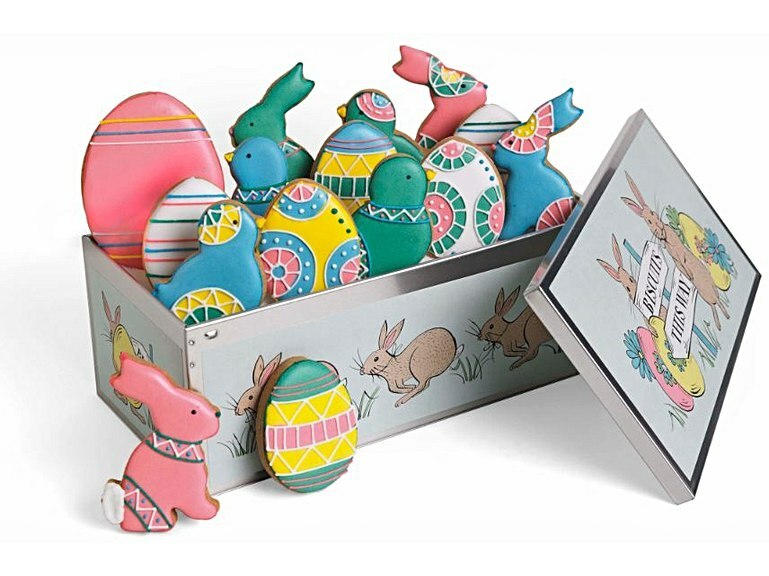 G&B’s Dark Easter Egg Collection (RRP: £31) – Green & Black’s Dark Easter Egg collection makes the perfect chocolate gift for indulging all your family and friends at Easter. Delivered in G&B’s gift box with a yellow hand tied ribbon. Open the G&B’s Easter Dark collection basket to reveal a selection of dark chocolate Easter eggs and dark chocolate bars. The Easter collection also includes new G&B’s Dark Chocolate Pralines elegantly packed in a gift box. Cadbury Easter Collection – Cadbury always release some delicious Easter goodies and this year they’ve really pushed the boat out. With the release of the Peter Rabbit movie, Cadbury has teamed up to release some seriously cute gift packs. 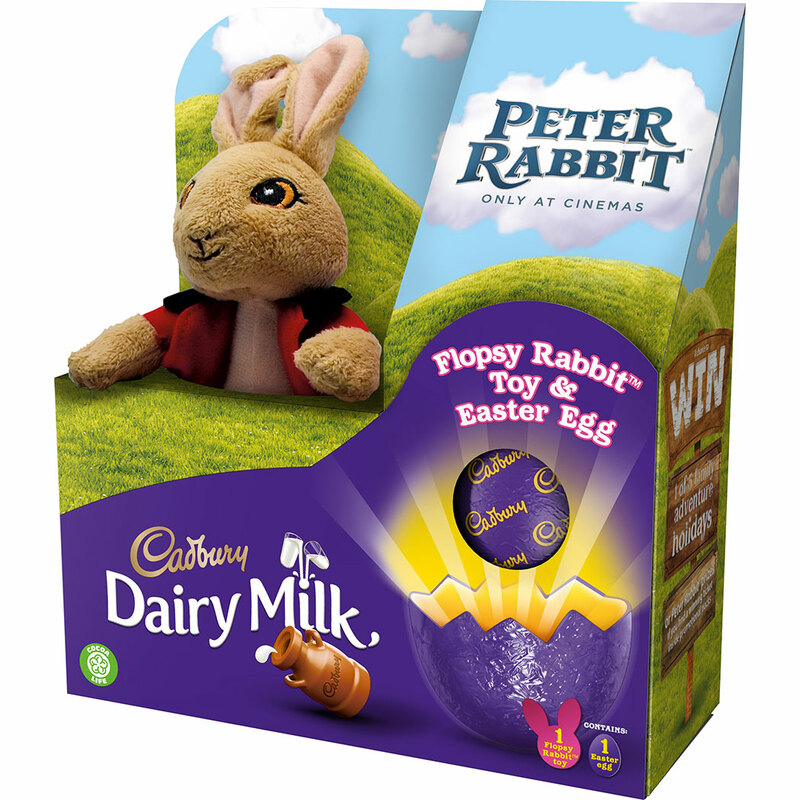 The new Cadbury Dairy Milk Peter Rabbit Easter Egg and Toy Pack combines an iconic, much-loved Cadbury Easter egg with a soft toy of either Peter Rabbit or Flopsy Rabbit – loveable characters from the new Peter Rabbit film that is out in cinemas now! 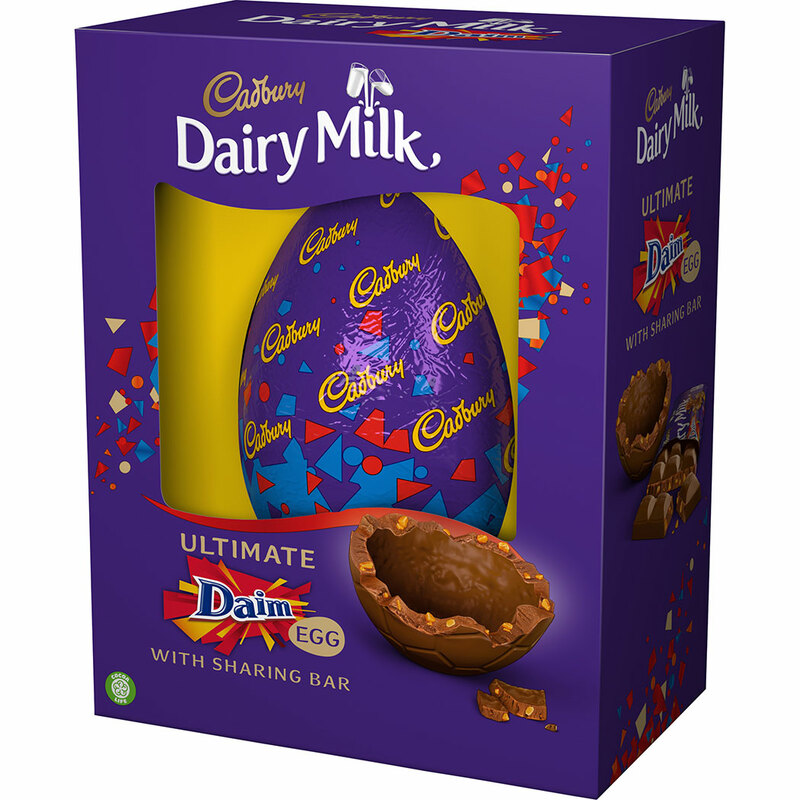 Also new for 2018 is the new Cadbury Dairy Milk Ultimate Easter Egg range – perfect for enjoying with family and friends! Available in much-loved Cadbury Dairy Milk Daim and Cadbury Dairy Milk Fruit & Nut. 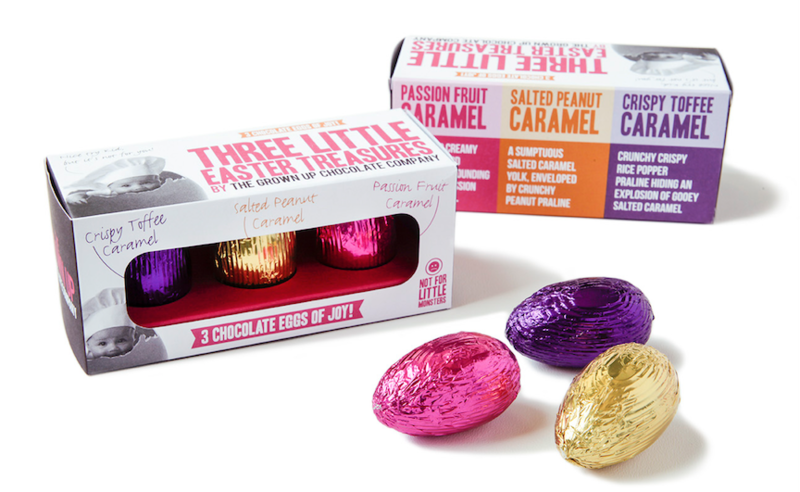 These completely unique Easter eggs contain hidden pieces of Daim and Fruit & Nut within the chocolate shell itself and come complete with a sharing bar of each to add to the eggs-travaganza. The Cadbury Crunchie Large Shell Egg is also hopping onto shelves in 2018. This large Cadbury shell egg comes with two Crunchie bars – perfect for those longing for a textured eat alongside their classic hollow egg. 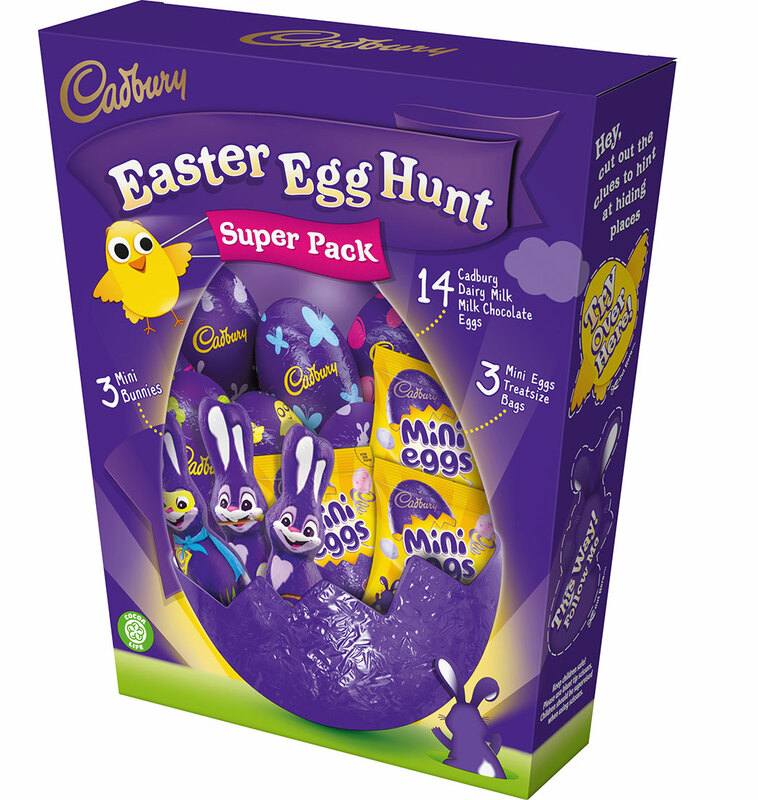 As well as the brand new Shell Eggs, new for 2018 is the Cadbury Easter Egg Hunt Super Pack, which makes putting on an Easter Egg Hunt even easier and more fun than ever before. Containing an egg-cellent selection of Cadbury chocolate treats such as Cadbury Dairy Milk hollow eggs, Cadbury Mini Eggs and Cadbury Dairy Milk bunnies – it has everything you need to put on a hopping great Easter egg hunt. 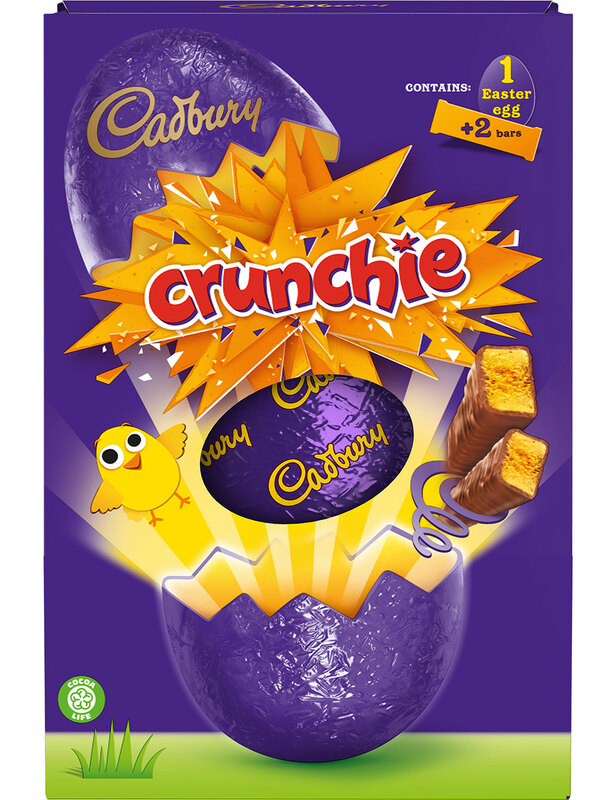 The range will also see the return of some of the all-time Cadbury family favourites, such as Cadbury Mini Eggs and gooey delicious Cadbury Creme Eggs – all of which are back on shelves for a limited time only. Link to buy!